We've talked about investing a lot these past weeks. It's one of the best ways to make money in game and we've been looking at current events and events to come - so it's only natural. The right investments are cheap, with a great profit margin but they do come with one downside. Space. Guild Wars 2 is a bit unique among the top flight MMORPGs in this regard. Your bank and your backpack are all limited by microtransactions. You know the scenario well I imagine. You have 1 inventory space free between bank and bags and you really need to cut out some junk but you have no junk - just alternate gear sets, items you want to keep and investments for the future. At this point a lot of people might be tempted to cut their projected profits and sell stacks of items at a sub par price. You don't have to do this! I know a lot of you won't want to spend on gems for bank space or backpack slots and that's something we'll look at later in this post. First of all I want to share a few tricks with you - ways to maximise your space without spending real money. First of all, think larger bags. They're an investment and I'm not suggesting 20 [11g+ each] or even 18 [2g+] slot bags (thanks to the runes required these aren't even cheap to make yourself) but 15 [60s+] and particularly 12 [20s+] are cheap to get. You'll be amazed at the difference this makes. Next up mules. Not donkeys, no. This is maybe an idea that's new to some but I'm sure it's familiar to the majority that read this site. You create new characters, buy them enough bags, ideally 10 [5s+] but 12 or 15 won't go amiss either (see above). Spare characters = free inventory slots (without paying). Because your bank is account bound, you can empty it into one mule and use the bank as a trading station between your mules. This is excellent and (as those of you who had mules in other games know) makes things so much easier when you have an item on one character you need on another. My final space saving tip for today is a bit more difficult but not beyond the reach of a regular gamer: guild bank space. Again Guild Wars 2 throws us a bone here (even if the microtransaction system is why we've got to try these workarounds in the first place) - you can have a guild just for yourself and still be in a dungeon/wvwvw/spvp guild at the same time. You've got to muster up the IP for the necessary architecture level and then for the first stash (and if you want more you have to keep going) and it can be slow, but it's not insurmountable. For my money, a character expansion slot is the best bet until you reach the limit. You can get 60 slots for 800 gems and <20 silver. That's 2 bank tabs (1,200 gems). If you're really flush with in game gold, that character can get up to 100 slots of free space. Talking about being flush, even if you are you need to weigh up the gem > gold conversion rates. It may be that that fancy 20 slot bag you want is worth more than 800 gems for a new character slot (and at least 60 slots). What other space saving tips do you guys have? I'd hate for anyone to feel like they have to give up on an investment for space related reasons alone! If you have a trustworthy friend you can use letters as a storage: just send them letters and ask them to return them to sender, that way you have 8-9 5 item storage slots for free. I have used the very limited capacity of the mail system as storage at times. 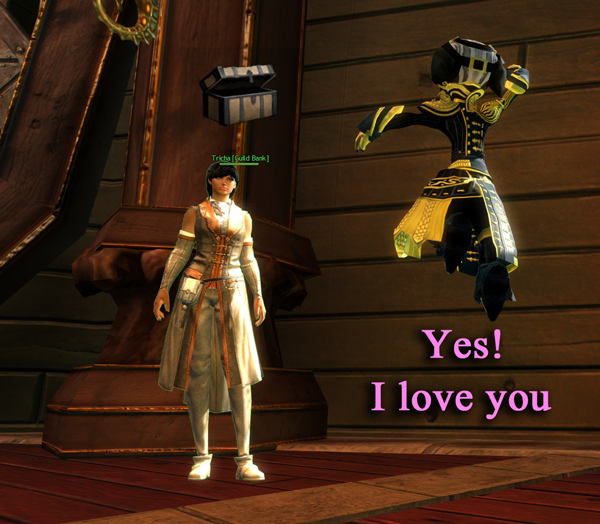 I mailed 5 stacks of tot items to a trusted friend only to have her send it back. Then I leave it in my post office. You can only access the last 10 messages at any one time, but the rest wait for you to clear the oldest. I "found" 45 extra slots that way and I'm still able to accept heart rewards with the last letter slot. Also this is a great way to clear your main character's inventory while away from bank access and transfering it to mule characters. A little more info on if/when the mail might delete my old messages would be nice, but nothing has been lost in the GW2 mailing system, which is more than I can say for my local postal carriers. Mail storage seems popular! I figured it would (and that's probably the reason Arenanet limited us to 10 per character). Nice post! Back in the days I got myself some gems trough gold, and bought extra bag slots for my character. Im also the leader of the guild Our Black Bird Cuts Itself [eMoa] which is based in the Far Shiverpeaks server. We currently have over 200 active people in it and we got all the upgrades. I made specific areas of the guild bank (250slots) available for public use, which they can take or deposit in. Ive got a 150 slot area specificly for a couple of friends which we use to store our investments in. So if you happen to be in a high position in a guild, or are good friends with its leader, this could also be an option for you. Keep it in your mail. Bounce mails off someone u really trust. It's not perfect but it's a short term solution if you really don't want to trash that item. Lol didt know the leader of my guild read this! Would be the same in the Trading Post. If you buy something just as an investment. Why even take it out of the TP until you need it? I mean after you buy it its in your own space in the TP. If you want to sell it you can take it then and sell it. One thing I don't like about this is that you can't take separate items or just money from the TP. If you leave investments in there you can't get anything out. But the TP isn't a bad idea if you want to store things while listing them, but then you've to pay the fee and to make sure it doesn't sell under what you expect you'd probably have to price it pretty high. well, when you buy something else you have to take out everything that is in the TP, right? or can u take separate things? There's just the 'take all' button which does just that!